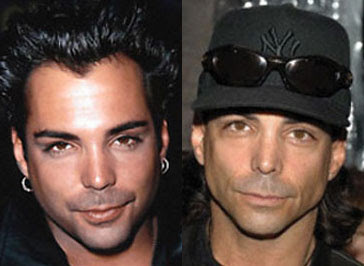 Richard Grieco before and after nose job plastic surgery? My oh my, what has happened to the once studly "21 Jump Street" star? Richard Grieco has seemingly been out of the Hollywood spotlight for the better part of a decade and now that he has reemerged, his former good looks seemed to have changed, for the worse. For starters, it looks like hes lost a good 25 pounds, which makes his face look kinda eerie and skeletal, and then we see this new slim pointy nose of his. I don't know if he went under the knife for a nose job or not, but clearly something has happened to the face of Richard Grieco, and plastic surgery seems like the only logical explanation to me. How possible is it for someone so angelic and beautiful transform into a nightmare from a train accident. The old nose etc looked so much better in it Irish way. Oh why oh why, is it possible for one so handsome to get so ulgy? No, not even with age even if you were older than Cloony, you would have been the most handsome. Better sue that doctor and restore your best features. I was just making love to your old pics and movies. Now you scare me...!!!!!!!!! As in most facets of life, looks are not always guaranteed. However, when you start out ahead of the game, it's not nice to fool with mother nature. Like the purchase of a car, home, or an appliance, I hope the product he purchased came with a guarantee. Greico is definitely entitled to a refund. Oh no, is that a mullet he's currently rockin?